"Local governments, as the level of government closest to the people, are best placed to partner with them to help them achieve their goals. They are on the front line when disasters hit communities and we have an important role to play in disaster risk reduction". 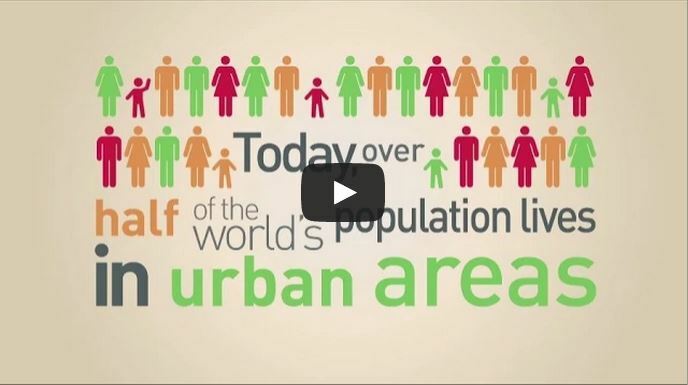 In 2007, the share of the world’s population living in urban areas surpassed 50 %. By 2030, approximately 80 % of the developing world’s population will live in cities. What can be done now to ensure that these cities can cope with such growth sustainably? Urbanisation is a phenomenon that will probably be both our biggest challenge, and our greatest opportunity to ensure sustainable development over the coming decades. This is why the stand-alone goal on sustainable cities and human settlements, Sustainable Development Goal (SDG) 11, is so important. Only by dedicating our attention and resources to the world’s cities, and by valuing and harnessing their relationship with their surrounding territories, can we be sure that urbanisation is a force for improving well-being and reducing our environmental impact. Today, urbanisation too often means urban sprawl, the urbanisation of poverty, and increasingly segregated and unequal cities. One essential tool to ensure the provision of basic services in new urban areas is strategic urban planning. Anticipating and planning for growth is far more effective than trying to retrofit slum settlements once they have formed. Sustainable development also requires significant international and national investment in basic services, particularly in rapidly growing cities in Africa and Asia. To meet estimated investment needs in urban infrastructure, the amounts currently invested would need to double by 2030. As well as urban planning and basic services, SDG 11 also covers other important areas of sustainable development, such as the need to reduce the environmental impact of our cities, make them resilient to disasters and safeguard local cultural heritage. However, while the stand-alone goal is a landmark achievement for the urban community, it is not enough by itself. To create inclusive, sustainable cities, all of the other SDGs must be achieved in our cities, as well as at national level. This is why we are advocating for the ‘localisation’ of the post-2015 development agenda. Kadir Topbaş: ‘Urbanisation is a phenomenon that will probably be both our biggest challenge, and our greatest opportunity to ensure sustainable development over the coming decades." ’Localisation’ refers to implementing and monitoring the agenda at local level, so that it takes into account different sub-national contexts, particularly the distinct needs of urban and rural areas. For example, a shared pit latrine might serve as adequate sanitation in a rural area, but it is not appropriate for densely populated urban settlements. The collection and analysis of territorially disaggregated data will make it possible to assess progress within countries, and to target resources more effectively so that no one is left behind. Local data is also a powerful tool to enable communities and civil society organizations to hold their governments accountable for their success or failures in managing urbanisation effectively. How can local authorities be empowered to tackle the complex challenges of sustainable urbanisation, which often imply tough choices for elected politicians? Habitat III is the United Nations Conference on Housing and Sustainable Urban Development to take place in Quito, Ecuador, in October 2016. This decisions taken at this conference will be the cornerstone of the urban agenda over the coming two decades and it is vital that local authorities are empowered in its definition, implementation and monitoring. The United Cities and Local Governments (UCLG) is calling for the United Nations to acknowledge local authorities as full partners in shaping the global agenda in an increasingly urbanising world. Decentralisation is the fundamental tool for empowering local authorities. While there has been encouraging progress in decentralisation in many parts of the world since Habitat II, in most countries responsibilities have been decentralised to local governments without the financing to carry them out. What is more, there has been a worrying trend in some countries for central authorities to respond to the financial crisis by taking recentralisation measures and increasing control over local governments to deal with their own fiscal problems. "While the stand-alone goal is a landmark achievement for the urban community, it is not enough by itself. To create inclusive, sustainable cities, all of the other SDGs must be achieved in our cities, as well as at national level. This is why we are advocating for the ‘localisation’ of the post-2015 development agenda." We must reverse this tide and make sure that we do not undo the progress we have already made. National and local governments must join forces to mobilise domestic resources and experiment with innovative financing models. In many countries, structural reforms are necessary to bridge the gaps in access to basic services and to allow decentralisation to fulfil its potential. It will be important to combine and coordinate efforts to achieve the SDGs with those to implement the Habitat III agenda, together with the disaster risk and climate change agendas. This will ensure that local leaders are not faced with conflicting or confusing messages from the international community and that local institutions have adequate funding to carry out their essential role in achieving these agendas. The role of local and regional authorities will need to be further acknowledged by enabling meaningful participation in the international process. This will lead to defining important agendas for local governments, including Habitat III. To this end we are committed to organizing the Second World Assembly of Local and Regional Governments in Quito in 2016 during Habitat III as a clear contribution to the agenda. From our side, local governments are working on fostering and expanding our partnerships with civil society, both at local and global level, so that we can ensure citizens have a say in shaping the cities of the future. Only with a true global partnership that includes everyone involved in urban development, will any agenda be sustainable over the long term. Programmes on water sanitation, solid waste disposal and slum upgrading have a direct health impact, as well as social and economic consequences, in urban centres. Across the world, we have seen that the best way to improve conditions in informal settlements is to work with the people who live in them. The men and women who live in slums know better than anyone else the priorities to address in their communities. Local governments, as the level of government closest to the people, are best placed to partner with them to help them achieve their goals. Local governments have been at the forefront of such initiatives, providing financing and logistical support to projects launched by slum-dwellers themselves, such as the construction of community-managed toilet facilities. In many cases, these partnerships have empowered women and girls in informal settlements, allowing their voices to be heard by local institutions, and enabling them to take on the role of community leaders. Some of the local governments that have been at the forefront of partnerships with community organizations are now carrying out peer learning initiatives so that others can learn from their experience. This kind of decentralised cooperation has always been the pride of the international municipal movement that UCLG represents. According to UN-Habitat, 21 cities of more than 8 million people in 2015 are located in vulnerable coastal zones. The Earth is experiencing an increasing frequency of climate-change driven natural disasters. What can be done in the area of disaster prevention to increase the resilience of vulnerable cities? Local governments are on the front line when disasters hit communities and we have an important role to play in disaster risk reduction. In many countries, we have responsibilities in areas such as urban planning and land use regulation, tools that we can harness to reduce the impact of disasters by integrating a disaster risk perspective in our work. We can also act to raise awareness among our populations about how to prevent, prepare for, and respond to, disasters. Local community institutions such as citizen volunteer groups can be important in ensuring mutual accountability and lasting positive change. Local governments can bring together all stakeholders in local resilience platforms to build on this principle. This is particularly important in the case of informal settlements with little or no access to basic services. The experience of local governments and city managers should be used to guide future national and global development agendas on disaster risk reduction. At international level, UCLG and our partners have carried out disaster risk training sessions for local officials, as well as giving our support to the United Nations International Strategy for Disaster Reduction (UNISDR) ‘Resilient Cities’ Campaign. More than 1,000 cities have joined this important initiative to raise awareness about disaster risk reduction. The Hyogo Framework has resulted in significant improvements in disaster risk management, particularly at the local level, through the ‘Making Cities Resilient: My City is Getting Ready’ campaign. However, there are still gaps in capacity, knowledge and financing at local level. To move forward, we need to implement all of the recommendations of the new Ten point Checklist – Essentials for Making Cities Resilient and monitor its success at local level using internationally agreed monitoring tools such as the Local Government Self-Assessment Tool or UNISDR’s City Disaster Resilience Scorecard. The EU Covenant of Mayors is considered by European institutions as an exceptional model of multilevel governance. In your role as President of UCLG, do you view the Covenant of Mayors as a model for other regions that seek to create more sustainable cities through ambitious energy and climate targets? The Covenant of Mayors is a visionary European initiative to encourage cities to make ambitious commitments to reduce carbon emissions. The model of sub-national cooperation to tackle global challenges was one of the founding principles of the 100-year-old international municipal movement. The Covenant of Mayors is a welcome continuation of this legacy. As President of UCLG, I encourage all regional and global initiatives that take a proactive approach to combatting the grave threat of climate change. It is inspiring to see cities taking the lead in tackling climate change from the bottom up through voluntary agreements, even while national governments and international institutions struggle to make progress. 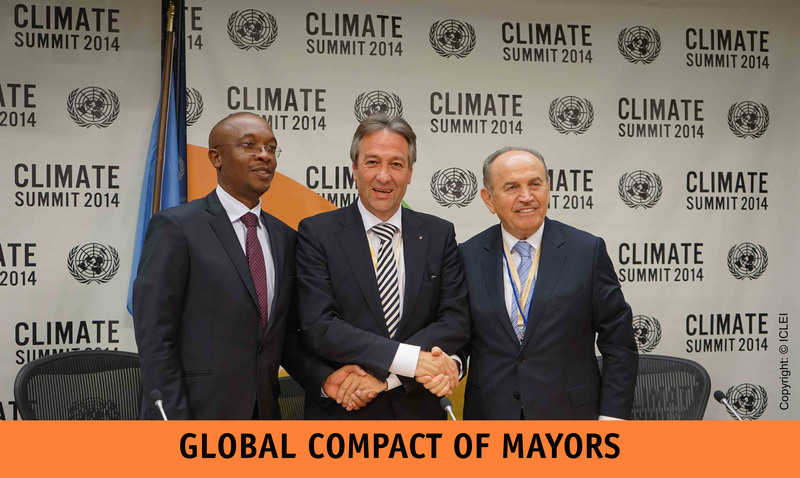 A similar and complementary initiative at global level is the Compact of Mayors, launched in September 2014 at the UN Climate Summit. The Compact is a partnership between the three leading global city and local government networks – the C40 Cities Climate Leadership Group, the International Council for Local Environmental Initiatives and UCLG – together with the UN Secretary General’s Special Envoy for Cities and Climate Change, UN Habitat and the UN Secretary General’s Climate Change Support Team. The Compact is not a ‘sign-up’ initiative for local governments; it aims to recognise and connect to existing initiatives, such as the US Mayors Climate Protection Agreement (2005), the EU Covenant of Mayors (2008), the Making Cities Resilient Campaign (2010), the Global Cities Covenant on Climate – the Mexico City Pact (2010), and the Durban Adaptation Charter (2011), among others. As such, the Compact of Mayors is a complementary initiative to the Covenant of Mayors and seeks to partner with it, recognising the work of the 6,000 European cities and towns that are signatories to the Covenant as the foundation for global action through the Compact of Mayors.